Across the Nullarbor, No 4 of Australia’s Greatest Drives. Tell anyone you’re driving almost 2,000km across the Nullarbor and you’ll get one of two reactions. The first is usually a mixture of bewilderment, pity and horror: “It’s so long and boring – why don’t you fly, or at least catch the train? It’ll take days and there’s nothing to see.” Others look at you enviously: “Wow, I’ve always wanted to do that!” The Nullarbor’s like that. There’s no denying it’s a long trip – four days, maybe more: it covers an area equivalent to England, Belgium, the Netherlands and Switzerland, with 7000km2 left over. And it’s definitely flat, with long sections of empty straight between tiny settlements where shopping, nightlife and good coffee is non-existent. But once you’ve done the trip you could never argue that it’s boring, nor could you say there’s nothing to see. As far as great Aussie road trips go, this one can’t be beaten. 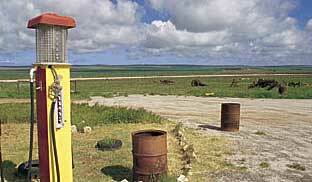 Balladonia was the site of the dramatic crash landing of the US Sky Lab Space Station in 1979. According to locals, the Dundas Shire Council presented NASA with a littering fine. Large sand drifts have repeatedly covered and uncovered the telegraph station (est 1887) at Eucla. Today it remains in ruin and the area is reportedly haunted. There are six lookouts over the Bunda Cliffs, aka the Great Australian Bight. The first is signposted shortly after Border Village. Check out the whales at the Head of Bight viewing platform 78km west of Yalata and 20km east of the Nullarbor Roadhouse. The Yalata Roadhouse, the best on the Nullarbor, also has an Aboriginal art gallery where paintings, carvings and other work by local artists are sold at a fraction of the price of city galleries. Ceduna Oyster Bar: snack on freshly shucked oysters and wine under an umbrella on the roof of the oyster shed overlooking the bay. The Quest Yelverton Kalgoorlie. 210 Egan Street, Kalgoorlie.